We've been a bit lax updating the blog with our latest episodes. So, to recap; Jonathan is in exile until further notice, I'm holding down the fort, and we've been bringing a few special guests on board. Our latest of whom, Mary Freer helps me dissect the career of Eric Cantona. Loved by some, loathed by many more, he was certainly one of the most magnetic players of his generation. Yesterday concluded the most coruscating weekend of football I've seen in a while; Spurs beating Liverpool 4-0, Blackburn's comeback 4-3 win over Arsenal, Napoli's storming 3-1 defeat of AC Milan, a scintillating Auld Firm derby with Rangers on the right end of a 4-2 result, PSV and Ajax playing out a 2-2 draw, and a combination of Real Madrid's loss to Levante, and a 8-0 win over Osasuna sending Barcelona back to the top of La Liga. New manager Andre Villas-Boas has had a tricky start taking charge of the West Londonders, and yesterday was the first time he has tasted defeat in England. But there are many reasons why the club and its fans should be in greater spirits now then at any other time this season. It's been revealed that Villas-Boas always planned to set Chelsea up in an uncharacteristically attacking manner, as they believed that trying to play cautiously would only result in a narrow loss at best, a heavy one at worst. Last Wednesday night, Benfica showed in the Champions League that without their defensive totems of Nemanja Vidic and Rio Ferdinand, United are vulnerable when put under pressure. Villas-Boas set the team up to move the ball swiftly, looking to create opportunities for Fernando Torres in at any opportunity, and for most of the first half, Chelsea looked dangerous in possession. 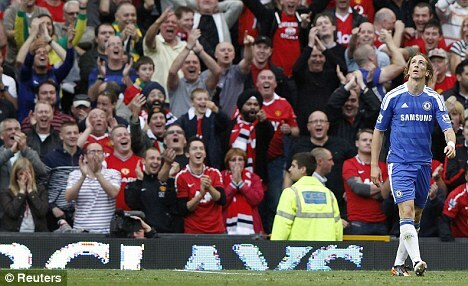 Ramires was twice denied by David De Gea; the second time when the Brazilian had the goal at his mercy. The otherwise lacklustre Daniel Sturridge also forced De Gea into action; the only reason why they were 0-3 in arrears at half-time was due to maddening wastefulness. United on the other hand, put on a finishing clinic, taking any chance that came their way, but the lead was not an accurate reflection of the balance of play. They ended the match with twenty-one shots at goal to United's thirteen. Villas-Boas was left with little recourse but to increase his attacking options in the second-half, bringing Nicolas Anelka on for Frank Lampard. The decision raised a few eyebrows as Lampard is part of the furniture at Chelsea, but they shouldn't have done. Anelka's first contribution was to play a sumptuous pass to play Torres clear on goal, with the quality of the ball matched by a gorgeous finish from the Spaniard, clipping the ball over De Gea to give Chelsea hope. More chances were created, especially for Torres, and I'm sure by now we've all seen his inexplicable open goal miss after rounding the keeper. Many people - me included - felt that Villas-Boas could endure a tough season, trying to evolve this Chelsea team from the all-conquering side that won back to back Premier League titles under Jose Mourinho in 2005 and 2006, and did the double under Carlo Ancelotti two seasons ago. The demands of the game move on quicker than ever these days, and a once dominant Chelsea now look like an increasingly stolid outfit in comparison to the fluid incisiveness that is a pre-requisite of any high achieving side. After a stodgy beginning to the season, Villas-Boas may be alighting on the answer to wean Chelsea's off their robust, muscular style embodied by the likes of Lampard, John Obi Mikel and Didier Drogba. While they are accomplished players who will have a part to play over a lengthy nine month season, they may no longer be part of Villas-Boas's Plan A. And despite the juvenile taunts that Torres had to endure after missing an empty net, his all-round performance was encouraging; his movement and application could not be faulted, he took his goal with the aplomb of a Marco Van Basten, and looks to be steadily improving after a moribund start to his Chelsea career. In the game now, speed and fluidity is the key to breaking teams down. Hence the prominence of Juan Mata, Sturridge and Torres. Anelka may also get plenty of game time as he made an impressive contribution from the bench, showing an intelligence and guile that is seldom associated with the Frenchman. Against United they passed the ball with purpose, attacked with menace, and had that intangible that every good side needs; devil. If this is a precursor to the new Chelsea, then their fans should be looking forward to seeing football that is not only entertaining, but also successful. And with Manchester City showing that their strong early-season performances have slightly gone to their head, there could be a second team for Manchester United to worry about other than their local rivals. While Blackburn have been given deserved credit for their first win of the season, they still remain one of the Premier League's most disliked sides. This has been the case since Venkys, the club's owners, fired Sam Allardyce as manager and replaced him with Steve Kean. Even in victory, you can still hear pejorative remarks made towards the owners, and how they made their money, often referring to them as "those chicken farmers" - as if such a thing means they have no place in the sport. Now there are plenty of things that you can criticise the Venkys regime for, yet every catcall comes with the reductive slur of "chicken farmers". It has a worrying underpinning of xenophobia; do people resent that a group of Indian businesspeople have gained a place in English football's top league? Also, some suspect that Kean got his position as a result of underhanded politicking. Now allow me to be clear. I predicted that Blackburn would be relegated. I still believe this. Nothing in their win over Arsenal convinced me that they'll end the season out of the division's bottom three. I don't think Venkys are particularly good owners, and I don't think Kean is the right man for Blackburn. But he and the owners should be given every chance to prove people wrong without being subjected to such infantile derision. So how about we treat them with a little respect in future? Arsenal are currently a club in choppy waters. A dreadful start to the league campaign, injuries to key players, and an addition of older players to a callow squad that some have dubbed as "panic buys". There couldn't have been a less opportune time for them to face a side that exemplify many of the qualities that the Gunners were once admired for. Arsenal play Borussia Dortmund tonight to open their Champions League campaign. Like the start of the domestic season, the fixtures haven't been kind to the North Londoners. Marseille will prove awkward opposition, while Olympiakos have an impressive home record. Their biggest test however, comes from the boys from Dortmund. And "boys" is almost a literal term. Borussia both shocked and pleased many neutrals in Germany by comfortably winning the Bundesliga last season, playing an expansive and entertaining brand of football that triumphed over the more traditional domestic powers. They are a relatively young team, with a relatively young coach. While I think Arsene Wenger should be allowed to try and return Arsenal to their former glories, if he were to leave, then the ideal replacement would probably be the Dortmund head coach, Jurgen Klopp. He has assembled a team built around the attacking talents of Mario Gotze, Lucas Barrios, and Shinji Kagawa. The impressive Neven Subotic and Mats Hummels anchor the defence, while experienced captain Sebastian Kehl knits the whole outfit together in midfield. Gotze is the key. He is the next to come off the increasingly impressive production line of dangerous German attackers. Like Mesut Ozil and Thomas Muller, Gotze has bundles of flair and mobility, moves like a whippet over the pitch, with the necessary amount of devil to unlock any defence. In short, he's the kind of player that children pretend to be when they play in the park. And with Jack Wilshere & Aaron Ramsey on the treatment table, and Cesc Fabregas & Samir Nasri now plying their trade elsewhere, Arsenal look alarmingly short on the kind of devil that wins matches. Once everybody's favourite side to watch, they have been short of a cutting edge, and remain suspect defensively. Against a passionate home support, and Wenger serving a two match touchline ban, Arsenal could be set for a painful reminder of the side that they once were in Germany. Earlier this morning, England lock Courtney Lawes received a two match ban after being cited for kneeing Mario Ledesma in the head during Saturday's Pool match against Argentina. When asked about the impact of Lawes's absence, head coach Martin Johnson seemed somewhat indifferent. While this is a wise move from Johnson, the chances are that his nonchalant stance was genuine. In what is a tricky Pool, England's next two games are also their easiest - against Georgia & Romania. Why this stands out as a story is that if the IRB (International Rugby Board) believed that Lawes was guilty, then a two game ban is relatively benign. This seems to be a case of the IRB having their cake and eating it; they look tough for punishing a player, particularly one from a major Rugby Union nation such as England. But the subjective weight of the punishment is negligible. Lawes is a key figure in this England side, and he may have been rested for their next two matches anyway. If anything, the IRB have done Johnson and England a favour. Flushing Meadows was the scene of 2011's sporting moment of the year as Novak Djokovic won his third Grand Slam of the season, defeating the defending champion Rafael Nadal in four gruelling sets (6-2,6-4,6-7,6-1). This has been Nole's year. He marmalised Andy Murray to win the Australian Open in January and hasn't looked back. His remarkable win/loss record continues, only two defeats in 2011 bringing him 10 titles, despite being pushed to the brink of physical exhaustion. While Nadal came into the final on the back of a straight sets win against Murray, Djokovic had to overcome a marathon five-set encounter to despatch Roger Federer in the other semi-final. The Serb was two sets to love behind, and like 12 months ago, had to save match-points before triumphing in dramatic style. While the final was only four sets, they bordered on tennis's apotheosis. The standard of shot-making, defence, recovery and athleticism left the fans and commentators searching for the superlatives. In both the first and second sets, Rafa took first blood to race into a 2-0 lead. Both times, Djokovic wrestled the momentum back. He was managing to muscle the Spaniard around the court and bend him to his will. It looked to be a repeat of the superiority he showed in this year's Wimbledon final. At 4-4 in the third, Djokovic broke Nadal again. Serving for the title, it looked all over bar the shouting. But there is no spirit more willing than Rafa's. He broke straight back, took the set to a tie-break, and won it convincingly. The crowd - now fully on his side - roared their approval; not because of a dislike for Djokovic, but because they wanted to see more of this extraordinary contest. However, at times, it manifested itself in them cheering when Novak failed to get a first serve in. While I've always liked the fevered atmosphere that one gets at the US Open, sometimes the crowd allow their emotions to descend from fervour into disrespect. This was sadly one of those occasions. Thankfully the quality of the tennis overshadowed the actions of a few thoughtless dingwads. And it's just as well that tennis balls aren't sentient as both players would have been charged with assault; they hit their shots with such savage ferocity that you worried for the safety of the ballboys & ballgirls. It mattered little as any time one man looked to have won the point, the opponent would find a way to lay their racket on the ball to continue the rally. 10 shot rallies became 15. 15 became 20. 20 became 30. It looked as if it would be a late night for every spectator, especially those in the UK. This was compounded by Djokovic calling the trainer onto court after losing the third set. Clearly suffering with his back, he periodically received treatment to nurse him through the match. With Rafa winning the third set, and Nole looking to be out of gas, many wise pundits expected Nadal to win in five. And a year ago, that might have been true. But "The Wall" is now a different animal. He has reached a level of dominance where he simply doesn't know how to lose at present. Two sets down to Federer, he'll find a way to win. An injured back and the sport's "Iron Man" in the ascendency, he'll find a way to win. It's what all great champions do. And Djokovic is truly a great champion now. He broke Nadal's serve at the first attempt, and with the Majorcan's resistance finally yielding, he went on to win the set 6-1, winning the match and securing his fourth Grand Slam title. Nadal admitted that he has struggled with his mental focus against Djokovic in the clutch moments this year. He hasn't been the only one, but it has been a chastening time for the Spaniard. It was not that long ago that some felt that he may be the greatest player to ever swing a racket, and despite winning the French Open, it's been a disappointing 2011. Djokovic meanwhile, has reigned supreme. He may not go on to equal the achievements of Federer and Nadal, but last night proved that he's no flash in the pan. You can hit a good run of form for a few weeks. But you don't fluke a whole year of competition. We've been in a golden age of men's tennis for a while now and Nole's achievements are making this era glisten ever more brightly. My focus is on the men's final is simply because it was one of the greatest tennis matches I have ever seen. But that doesn't make the women's final any less significant. And it's a pity that Serena Williams' conduct has been the main story of the women's section of the draw. If you really want to know what happened, read elsewhere or do some Googling as I'd rather focus on the victor, Sam Stosur. Once a leading force in the tennis world, there has been a relative paucity of quality to come from Australia in recent years, which is unbecoming for a nation that gave us Rod Laver, Evonne Goolagong-Cawley, John Newcombe and Pat Cash. With Lleyton Hewitt gone from the business end of Grand Slam tournaments and Bernard Tomic still green, the focus of Australian tennis attention has been placed firmly on the shoulders of Stosur. And it's attention that she has struggled to deal with. After reaching the French Open final in 2010 as the favourite, she choked against the Italian, Francesca Schivaone. The press correctly focused on Schiavone grabbing her one shot of glory, but it left Stotur's confidence in tatters, as she took months to cope with defeat; her game deteriorating into an inconsistent mess since that summer's day in Paris. So we should all delight in her regaining her form to not only win the US Open, but to win with a dominant display of superb hitting. Even Williams, who is not often the most gracious of losers, admitted that any questionable umpiring decisions were a minor factor in the match, and that Stosur was the better woman on the day. Williams is a great champion and is a safer bet to win Grand Slams in the future than the Australian. 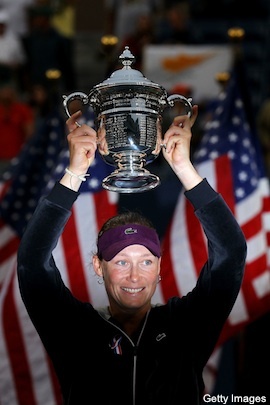 But Stosur's win was one to relish. It should resonate with anyone who's fallen short in achieving their dreams, but refused to allow it to define them. Failure isn't always the endgame, sometimes it's a pit-stop to a much more fulfilling destination. While a great deal of sport is devoted to its winners, sport is actually more about failure than success. The same way that every fairy-tale needs a dragon to be slain, sport's tales need a loser to be vanquished and leave the victor exalted. And like fairy-tales, there is a demarcation as to who plays the role of winner and loser. Two weeks ago, we approached the World Athletics Championships in Daegu with a clear expectation of the men and women who would leave South Korea triumphant. But it turned out to be a championships where many of the sport's understudies decided that this was their time to grab the spotlight and leave track & field's more established names in the shade. The meet became a less duplicitous version of the wonderful Joseph Mankiewicz film, All About Eve. The list of established favourites that failed to top the medal rostrum became the story of the championships; Usain Bolt, Jessica Ennis, Yelena Isinbayeva, Phillips Idowu, Allyson Felix, LaShawn Merritt all missed out on expected gold medals. The only marquee names who seemed to be unaffected were David Rudisha and Sally Pearson - whose performance in the 100 metres hurdles was arguably the star-turn of the championships. The reasons for these relative surprises were varied. Idowu, Felix, Ennis & Merritt all performed well - normally well enough to win gold - but came up against a new generation of athletes who seized their moment. Isinbayeva looked ring rusty after taking time away from the sport, with Daegu coming too soon for the Russian. And Bolt... well, enough has already been written about his false start in the 100 metres. But this needs not be a portent of the established powers being swept away by a new breed of runners, jumpers and throwers, as these World Championships will matter little in a year's time. The countdown to the 2012 Olympics has truly begun, and for the competing athletes, every moment of the next 12 months will go towards ensuring that they arrive in London at the very peak of physical conditioning. While winning a World Championship can make one a national hero, winning an Olympic title makes one a legend. Coming up short in Daegu only brings London into sharper focus. And the pain of failure could end up as a crucial part of a redemptive summer next year. All these aforementioned athletes are champion performers, and it's not in their nature to settle for second best. We've seen the likes of Bolt and Ennis be dominant on the track. It'll be fascinating to see what happens when their mood changes from supreme to angry. Daegu 2011 will have left a sour taste in the mouth for some. Which could make London 2012 the place to witness their sweetest revenge.